Over the last couple of weeks I have been making progress and strides towards my goal of spending less this year. I know it’s all still fresh and I am excited about challenging myself, but I’ve made a plan, and taken some actions that will truly help in the long run. 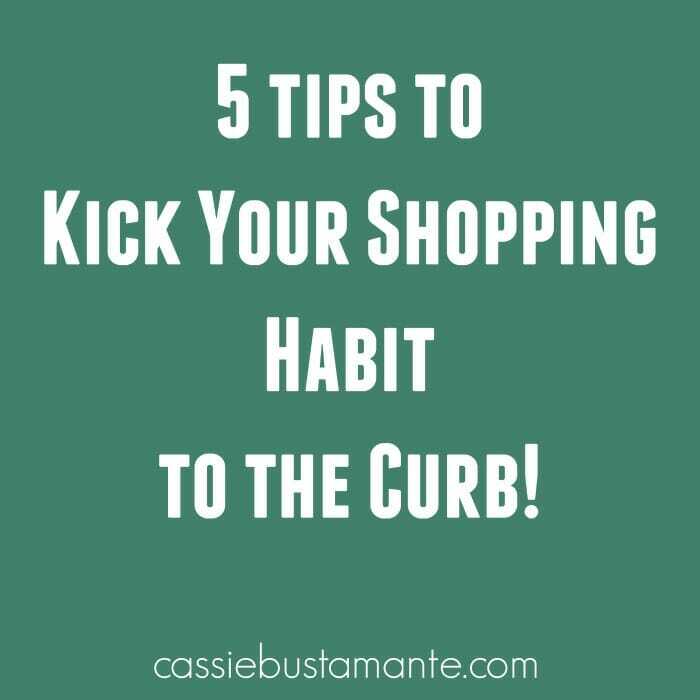 Today I wanted to hone in on one are of spending that could use some trimming of the fat and share with you my 5 tips to kicking a shopping habit as well as some bonus ideas to help you spend less if you must shop. If you’re just here for pretty pictures, you may want to pass on by! Unsubscribe from Email Subscription Lists– On Monday January 2, I sat down at my computer and went to my inbox. I use gmail which conveniently separates “promotions” into a separate file. That box was full of “New Year’s Sale!” and “Workout Gear for the New Year” and all sorts of sales-y promotional emails. I went through them and unsubscribed from every single catalog retailer and online shop in the home, fashion, beauty sector as well as those selling services. Out of sight, out of mind. Now they won’t get me with their “40% off” or “huge sale!” And in all honesty I know that when I have a legitimate need for something, I can most likely do an online search to come up with some sort of coupon code for that shop. Turn Off Facebook Notifications– I have to admit, I am in a few of those facebook sales groups and I’ve shopped in them. I love what I’ve purchased from them, but I don’t NEED it, and those groups are made to make you feel the urgency… “flash sale this weekend!”… so you see something and you just write “SOLD!” because you don’t want anyone else to get it before you. I mean, I even had Emmy next to me one night cheering for me because I got the bear leggings I really wanted and I beat the other girls. Is that what I want to teach her? That shopping is a competition so you buy to win? Nope. Once I got through my email subscriptions, I turned off all notifications for those groups, so now unless I go to them, I won’t see the items being sold, read about the flash sales, and feel the urgency. If I need something from them, I can go check them out, but no more frivolous spending. PS-NOT A WORKING PHONE! She used it to take photos and listen to music in the car! Use a Shopping List to the Tee– I am so guilty of heading to Costco with my list of needs, and then meandering into that center area to take a look at all the fun things they have. At Target, it’s the sneaky dollar spot. And they’ve wised up at Target and now have items up to $5 so our spending in that area goes up as well… it still seems like a sweet deal, but it will get you! Now when I go to Costco, Target, or even the grocery store, I have a much more detailed list of needs and I follow it to the Tee, checking off as I go. The only exceptions are made for every day items we eat or use that are on major sale… no exceptions made in the dollar spot, or just because something is a great deal. If it’s not on my list and I don’t need it, I don’t buy it. Period. Meal planning of course would be helpful to shopping by a list exactly, and I am not quite there…. or even close. I just keep the house stocked with the foods I know we eat. This also snowballs into my Amazon spending. I would see something I loved on a blog or in a magazine, and think to myself, “I bet I can find that for less on Amazon!” and feel justified in my purchase of a steal, but in the end it’s still needless spending. Removing the temptation is a huge help for me personally. Shop Your Own Home– If you are craving change in your home, there’s no reason why you shouldn’t go for it just because you don’t want to spend money. You don’t have to buy anything! Just shop your own house and rearrange what you already own creatively. 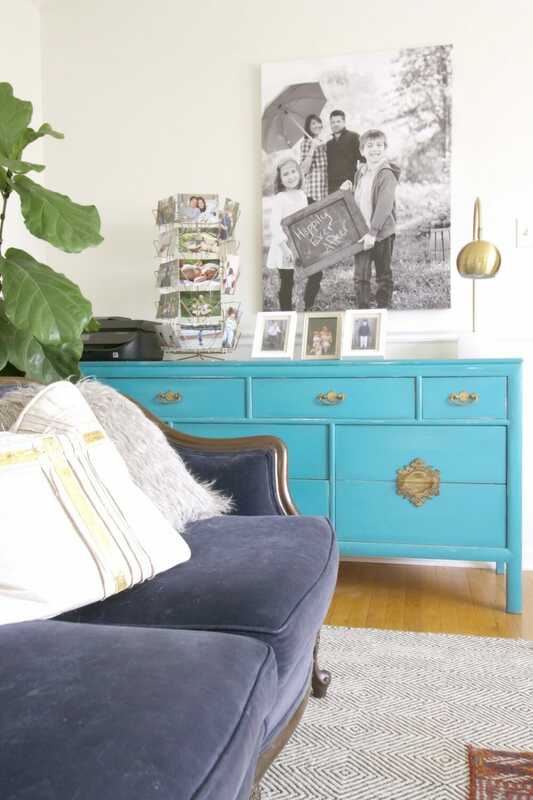 Try a new furniture arrangement; swap art, furniture, and pillows and accessories from room to room; restyle what’s there. I find that sometimes it helps just to empty the surface of a piece of furniture entirely, and then restyle it using some of the same things for an overall new look. You can read more about how I shopped my own home here. Now I have just a couple of little bonus tips for you if you must shop and if you’re a reader like me! 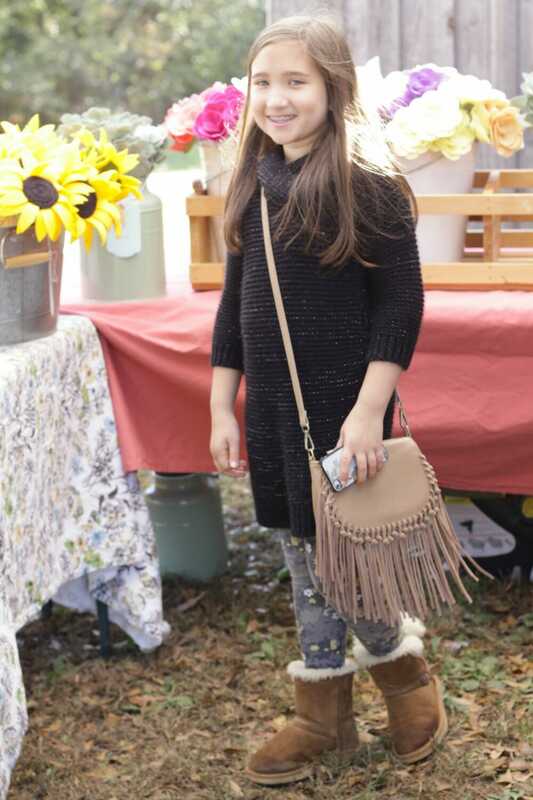 If you are headed out for a fun afternoon of shopping with a friend, set your budget and bring only that amount in cash. Don’t use your debit card! You’ll save money, make much more thoughtful purchases, and focus on the time spent with your friend rather than what you’re buying. It’s only the end of the second week of the month, but so far these little tricks have really helped me along. Eliminating temptation from my life is huge… the less I see on the internet, in emails, or in magazines, the less I feel like I am missing and the more content I am with what I have. As a bonus I’ve got more time on my hands to do things! The progress I’ve made so far encourages me; and I know if I can cut down my shopping, you can, too! yes- i don’t ever go to those stores and then i let myself before christmas and i spent way more than i needed to so i am back to not going. Having just watched Minimalism, a documentary about overwhelming consumption in the U.S., with my children last night, I found this post right on spot. I myself, have always been thrifty, but sometimes I am drawn to the bargain just because it’s a bargain. It’s a tough habit to break, but if you shop less — online and at stores — it’s not that hard. Fill your time with volunteering, time with the family, exercising or reading. i watched that a couple weeks ago and LOVED it! i can’t be a minimlaist (i mean, let’s be real!) but i can cut back and simplify and spend my time with people i love doing things i love! This is such great advice, Cassie! I’m guilty of buying things just because they’re a fantastic deal – and then not really loving them or having a place for them. Especially at thrift stores, which, let’s face it, is where I spend 90% of my free time. When I find something “good”, I try to ask myself, “Would someone else enjoy this more than me?” and if the answer is “Yes” I try to convince myself to leave it behind for them to discover. It’s helping me cut down on impulse buys of things that don’t really work for my home! i love that approach! good thinking and i will have to apply it next time i actually head out to the thrift shop. haha! i don’t GO to target! period! i only went over christmas and then i was sucked right back in. Hmm, pop up ads for shopping that I click thru to read the article about kicking shopping habits, ad on top of the article, ads to the left of the article, and shopping ads interspersed throughout the article…guess I need to take your advice and avoid blogs for a bit!! Well, I am glad I inspired you then, even if it wasn’t as I intended. Unfortunately blogs cost money to run, so I need ads to keep it self-sustaining. the look for less and still fuel creativity. Spend less do more. LOVE the 2017 motto! I was with you right up until you rejected the $2 elephant! ;). Kidding…mostly. Great tips…I’m definitely guilty of spending too much by pretending the thrift store is the same as free. haha!!!!! you should go get that elephant. Great post, Cassie! I’ve done some of the same things in my effort to simplify and declutter my life. I noticed I spent MUCH less on RueLaLa when I wasn’t getting those pesky emails every day with all of the CLOSEOUT LAST CHANCE etc etc sales pressure. I can imagine as a blogger and a former retail business owner, it is especially challenging not to constantly seek out and hold onto “stuff.” I keep trying to remind myself that when I’m on my deathbed, I am not going to wish I spent more time on Facebook and reading blogs or buying vases at HomeGoods and clothing I don’t need. So this year is all about finding my passion, making memories, spending money where it counts, and pursuing happiness! Thanks for leading by example! oh my gosh it is so hard because my brain still sees things and thinks, oooh we could style this this way and sell it, or we could paint it this way, but i am finally starting to get to the point of not feeling that need to purchase a great vintage deal. like you said, i think about the end of my life and what will matter, and it won’t be the things. we are still spending some money, but it’s on things we are doing together instead or projects that have longevity. All of these are such great tips! I’ve been needing to unsubscribe from all of those emails. I usually don’t buy anything, but they’re still annoying. And Target. Love hate relationship. Go in for hangers and leave having spent $100. Cartwheel app makes it worse. Who are they kidding. You’re not saving any money when you end up buying crap you don’t need just because it’s on sale. I keep seeing everyone post on all the new stuff there. I can’t go in. I just can’t go in. thank you so much, shelley! haha! i agree about target so i honestly don’t go in for that reason… but over the holidays with christmas shopping i became SO WEAK. Oh how I love this, friend!! I need to do so many of these RIGHT NOW!!! You’re the best! I’m so grateful for you! Great post Cassie. I’m not much of a shopper but I do totally and completely overspend at Lowes and Home Depot on things like lumber and odds and ends needed for a project! well that’s excusable if you need it! i am trying to rework some things in my house so i just listed a bunch on craigslist… if i can sell it and spend the same or less, i am ok with it! Well…I feel ya about “shopping your house” as i do that for me and others all the time. I LOVE your tip to unsubscribe to emails!!!! I think I can do that while watching TV as I have SO many on two different accounts. Great advice. Thanks! thank you so much, mary ann! i appreciate you stopping by and leaving a thoughtful comment! 🙂 and oh i can’t even tell you how nice it is to not wake up to 5,634 emails each morning trying to sell me something. Best of luck in 2017! I’m sure you’ll have tons of savings success. yeah, target is 20-25 minutes for me, and we have a little PA dutch market in town that has a lot of dry good needs thankfully. i don’t like to cruise because it causes all of that “i want i want i want!” so it’s best for me to avoid it at all costs. i was there where i didn’t even want to go but then the holidays came and did me in. Wonderful.tjis is so patronizing, but I’m really proud of you, and I don’t mean that in a patronizing way. Does I’m so happy for you sound better. I can remember my mother stopping her magazines, explaining to me that the contributed to discontent. I’m like you, saving magazines. But about a year ago I emptied the house of all of them. I never looked at them and they took up a considerable amount of space. Just having them gone made me feel better. Somehow, we have migrated to my husband making Target runs. This really helps. He also does the Costco shopping. Look at me, making a whole post! Anyway, I wish you well with your endeavor. You are certainly on a great track. i don’t think it’s patronizing coming from someone who has done it and knows how much better it makes you feel!!! thank you SOO much for that, karen! Fantastic take. I have a secret hoard room in the basement and I find things that sometimes are unwrapped in there! It would definitely do me good to shop that room before anything. BAHAHA!!! that’s hilarious! you totally should. I liked this list! I actually read it when it came out, but have been too busy to pop by and comment! You have spurred me to unsubscribe from all the email lists too! thank you so much, alyson! it feels good but there are certainly times i want to slip. we bought a new computer yesterday which we had been planning for a while…. and as we headed to the apple store we walked by anthropologie. i did not go in, but man that was hard!